Recently, Nikon announced a number of new digital compact cameras sporting all sorts of innovative features and technology. 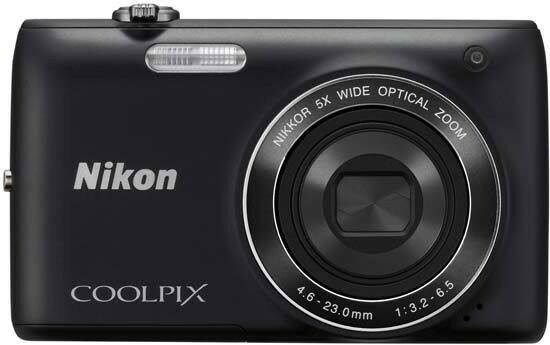 The Nikon Coolpix S4150 is no exception with an EXPEED C2 processor, 14 megapixel CCD sensor, 5x optical zoom lens, touch-screen interface, 720p HD video and subject tracking auto-focusing. As part of Nikon's Stylish range, the S4150 certainly has the good looks to fit into the lineup with its curves and funky colours. 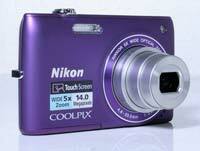 The Nikon Coolpix S4150 costs around £180 and is available in black, silver, red and purple. In terms of innovation, the Nikon Coolpix S4150 is one of the less interesting new models from the recent launch. That's not to say that it's a camera that should be swept under the carpet and forgotten about. In profile, the S4150 is a slim and pocketable model with curved ends that then bulk out to house the touch-screen LCD on the back. It would look nicer if the black plastic back wasn't present, to give the camera an ultra-thin exterior. We're undecided on the two-tone paintwork. One half says that a one-colour model would look better but the half that stays up late watching Pimp My Ride likes the two-tone styling. 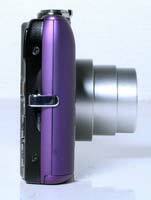 The lens on the front of the Nikon Coolpix S4150 is pretty small despite the large bezel that surrounds it. A slim flash sits satisfyingly away from the glass to ensure a lack of red-eye whenever it's used. On the top, the two buttons for power and shutter release are small with a delicate zoom wrapped around the latter. On the back, the design mocks the S6150 - a higher spec model - with three buttons situated down the right side of the 3 inch touch-screen. Above the top button is a small resting place for your thumb when you're taking pictures. There's no rubbery material to provide grip but there is a small raised area in the moulding of the case to catch onto. The three buttons are for direct video recording, modes and playback. If you use the video recording button it will go straight into recording. Changing the resolution must be done in the menu on the screen. Zooming is possible when shooting video and in normal circumstances it can't be heard. However, when either end of the zoom range is reached, there's a clicking noise that can prove annoying after a while. Picture quality doesn't look too good even though it's HD quality,a lthough at 720p, it's not Full HD. There are only 3 shooting modes on the Nikon Coolpix S4150 which are accessed by pressing the middle button on the back. You can choose from auto, scene modes or smart portrait. Auto mode gives the most options in the menu system and we found that it will cope with all but the most extreme modes. There are two menus on screen which is part of Nikon's attempt to simplify their range of digital compact cameras. It has worked with the layout taking on a thumbnail approach. Both menus are opened using the touch-screen; one on the side and one on the bottom. On the side, the menu has only four options for flash, self-timer, macro and exposure compensation. On the bottom, the menu displays resolution, touch-screen AF options, ISO, white-balance, video resolution, video AF, wind noise reduction and an access to the Set-up menu. Compared to other digital compact camera menus, the Nikon seems sparse. However, it appears that everything that a user needs is available. Remember, the S4150 is aimed at someone who only wants to point and shoot and won't know or care about expanding features. For that reason, it's actually quite an intelligent move on Nikon's part. It makes the S4150 more appealing to new comers to photography and the happy snapper crowd. The Nikon Coolpix S4150 is built to a decent standard. It's not breaking any ground but the front is made of metal with a plastic back. The lens is a NIKKOR type but doesn't feature any ED elements. That could cause problems with sharpness and chromatic aberration - our performance tests will show any of that up. The touch-screen isn't the most sensitive we've used. The problem that any touch-screen has these days is that most people own a smart phone with an ultra-sensitive touch operation. Anything less than this and it feels lacking. The Nikon is nowhere near as sensitive as it could be. Reviewing images is a pain - especially when trying to delete selected pictures. We found that if you try to tap the picture to mark it for deletion, most times the pictures will keep scrolling and the picture won't be selected at all. Of course, that's using fingertips which is the most convenient way. The actual and most effective way is to use the touch pen that's included with the camera. Using this will avoid the previous issues, but we think it's rare that anyone will use it, especially on a night out. The battery and memory card share the same compartment on the bottom of the S4150. The battery is a lithium-ion type EN-EL19 and also fits the Coolpix S3100, S100, S2500 and S2550. The cover to the battery compartment could be a bit stronger, but there's a metal plate to reinforce it and it does a good enough job. It flips out quite far compared to some other cameras which means it gets out of the way when retrieving the battery, but it's more susceptible to being caught. The USB port is situated right next to the battery compartment. Being on the bottom of the camera poses a problem - it has to be laid on its back to be linked to the computer or charged. This increases the chances of scratching the screen, which is unfortunate. The S4150 can be charged directly from a computer if you need it to be. Our tests of the shutter lag found that the Nikon Coolpix S4150 is a bit slower than other digital compact cameras. A typical lag is around 0.08 seconds, but the S4150 showed consistent real-life results of between 0.18 and 0.24 seconds. It sounds insubstantial but could be the difference between successfully capturing a baby smile or a dog turning away or missing the moment altogether. The S4150 only has one drive mode which is located in the bottom menu on the screen. We managed to record 8 shots in 10 seconds giving a continuous shooting speed of 1.2fps (frames per second). It's not a bad result for this type of camera and it's a continuous speed. Some cameras will spurt 3 or 4 pictures out in 1 second then slow down for the buffer to catch up. The fastest we could get the Nikon Coolpix S4150 to start up and take a focused picture was 3.5 seconds. The actual start up time isn't that bad but if you press the shutter release button to focus and shoot before the camera is ready, it won't do anything. To enter the playback menu, press the bottom button on the back of the S4150. The most recent picture you took will be displayed on the screen and you'll see a menu arrow at the bottom. To the right is a tab with a star on it. Here you can give your pictures star ratings to prioritise them and make them easier to find when you're looking for them on your computer using ViewNX. You can also view your favourite pictures by pressing the playback button again. We really like the idea of the auto sort mode in the same menu. It divides the pictures up depending on the mode you were in when you took the picture. Erasing pictures on the Nikon Coolpix S4150 isn't an easy feat. The pictures scroll along nicely for you to look at them and deleting one or all is an easy enough thing to do. Erasing selected pictures can be difficult though. You have to scroll through the pictures by swiping the pen or your finger along the screen - much the same way you view pictures on a smart phone. To delete selected pictures simply tap the one you wish to delete and a small tick will appear in the top left corner. However, should you create any type of movement on the screen with the pen or your finger when selecting the picture, the camera assumes you wish to move onto the next picture. It took us 5 minutes to delete 55 pictures. The documentation included in the Nikon Coolpix S4150 box includes the basics needed for getting you going. All the in-depth information is found on the user manual that's on the included CD. Another CD holds the ViewNX 2 software which is Nikon's tagging and basic editing program. You certainly don't need to install it, but if you don't have anything like it, it can make life easier. You also get the appropriate chargers which connect to the USB cable to reduce cables and allow charging from a computer. There's also a USB cable for linking directly to a television, however the cables on the opposing end are analogue so you lose the digital video quality straight away. Also, there's only a white audio cable meaning the sound will be mono. Considering Nikon are pushing the video capability with stereo sound, they don't give you the option to see it out of the box. It seems bad to end on a negative point, especially as the Nikon Coolpix S4150 is a nice little camera. There's plenty going for it features-wise so don't write it off until we've got through the image quality test.